I have got such a backlog of finished makes to show you! The problem with working an office job in amoungst spending every weekend at the boatyard AND trying to push out a new pattern (which is 95% done now, I swear! ), is that what precious little time I've got left goes into sewing instead of actually taking photos of said makes. So I hope you'll forgive the quality of these photos and instead applaud our creativity in taking them at all! 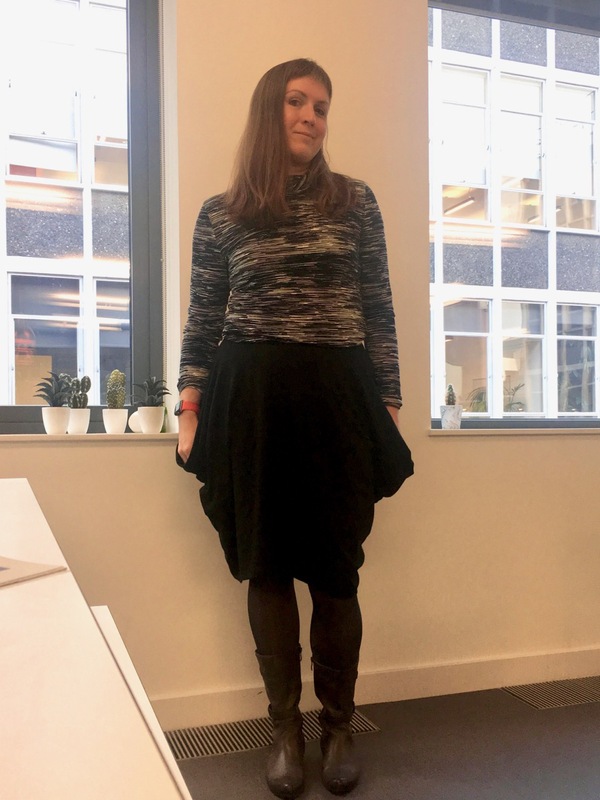 If you recall, one of the four makes in my Fall/Winter plans was a Longshaw Skirt from Wendy Ward's book "A Beginner's Guide to Sewing with Knitted Fabrics". 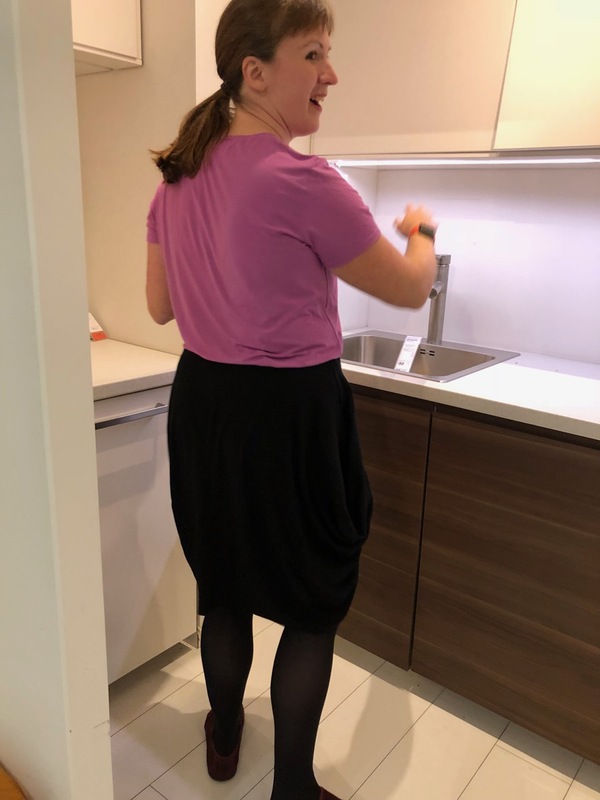 If you recall, one of the four makes in my Fall/Winter plans was a Longshaw Skirt from Wendy Ward’s book “A Beginner’s Guide to Sewing with Knitted Fabrics”. And I actually made this back in September using a luscious soy/cotton mix jersey I’d bought in Denver at Fancy Tiger Crafts in May. 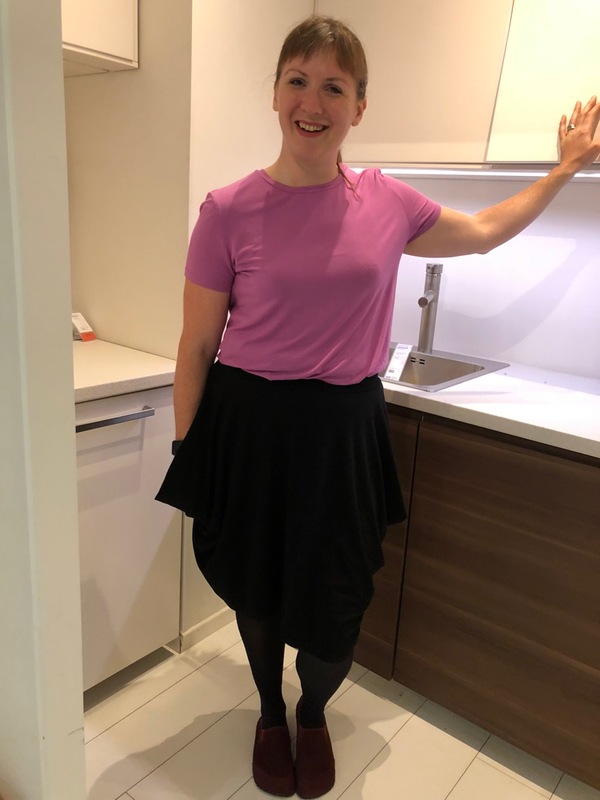 I only bought 2 yards of it but because I’m the fabric tetris master, I managed to squeeze this skirt AND a basic teeshirt (the Loose Fitting Top Block from my “Sew Your Own Activewear” book is my go-to teeshirt pattern this year!) out of the yardage with hardly anything leftover. And to be perfectly honest, I wasn’t quite sure whether I liked this skirt or not when I first made it. The drapes at the side mean there’s a LOT going on there, and I’m used to wearing a lot of pencil skirts or A-line at my most extreme. So this was a big departure for me style-wise, but the more I wore it, the more I liked it! 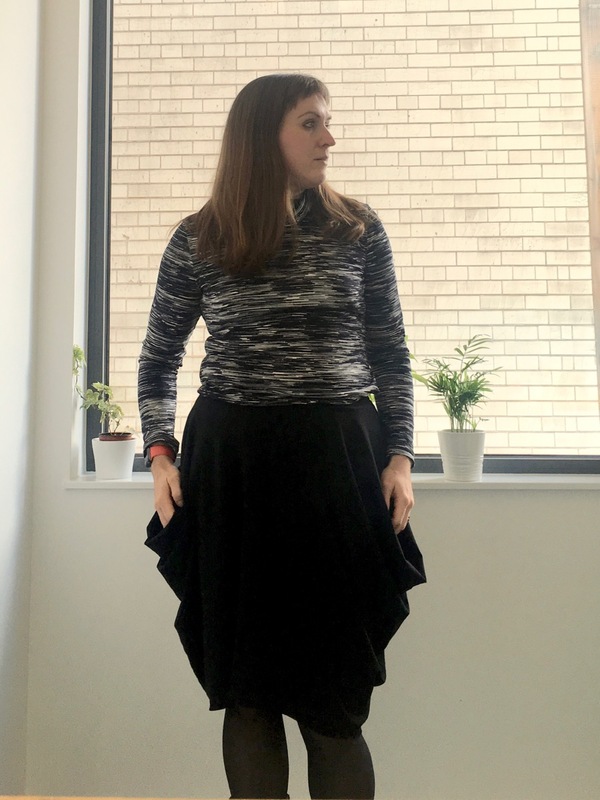 It’s a really great skirt for pairing with said teeshirts, as it elevates the look to something more special, but it still feels like wearing pyjamas! 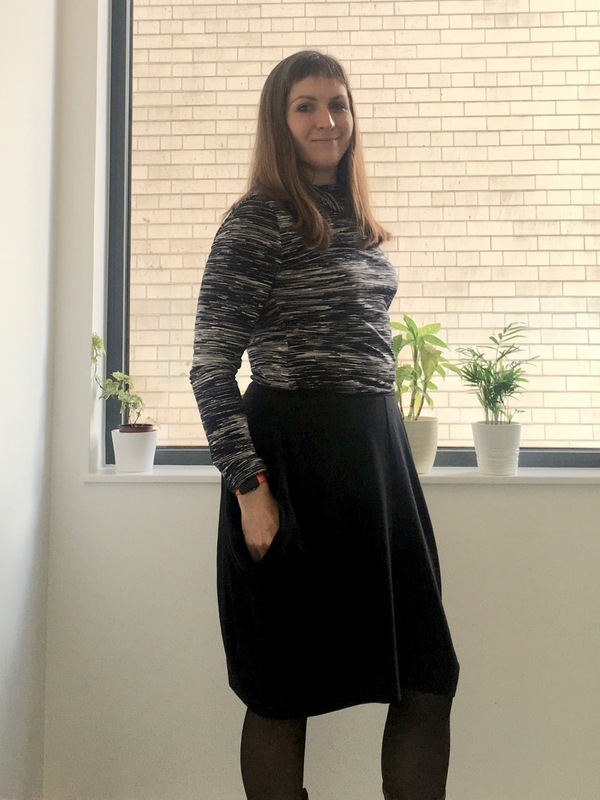 I have a feeling I’ll get a LOT of wear out of this over the winter, as it’s pretty practical for the office (seen here paired with this polo neck top), as well as late night shopping trips to IKEA to buy kitchen and bathroom supplies for the boat renovation (seen above with this bamboo tee!). Plus it’s got those big pockets hiding in the deep folds, and I’ve gotten SO many compliments from coworkers whenever I wear it, and that always feels good, too. 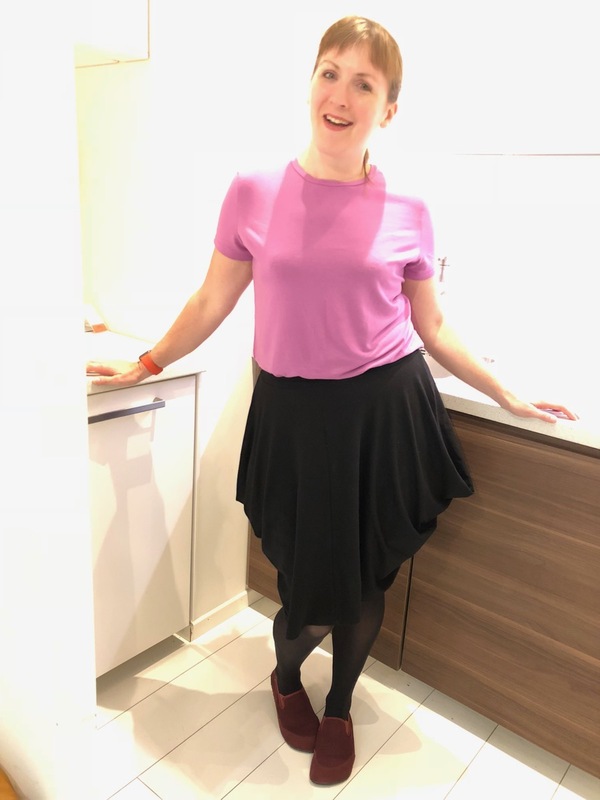 Even though I haven’t blogged it yet, I also already made my slogan tee and I’ve cut out the Burda top (though it’s been sitting waiting to be sewn for a few weeks while I prioritise samples of the new pattern). So just give me a few solid evenings and I might actually have the Fall/Winter wardrobe in reality, too! What do you think? Do you choose styles that are sometimes out of your comfort zone? Separator image Posted in Gallery and tagged with knit, skirt, wendy-ward. Yes, I do and too often they go right to the donate bag. Sometimes, though, I make something that just works on all levels. It’s those times I’m glad I sew. Yes I do. I choose things out of my confort zone a lot since I started to sew. When I only wore RTW I stayed with the same basics all the time but sewing has meant I experiment as much as I did at age 16-20 so loads. 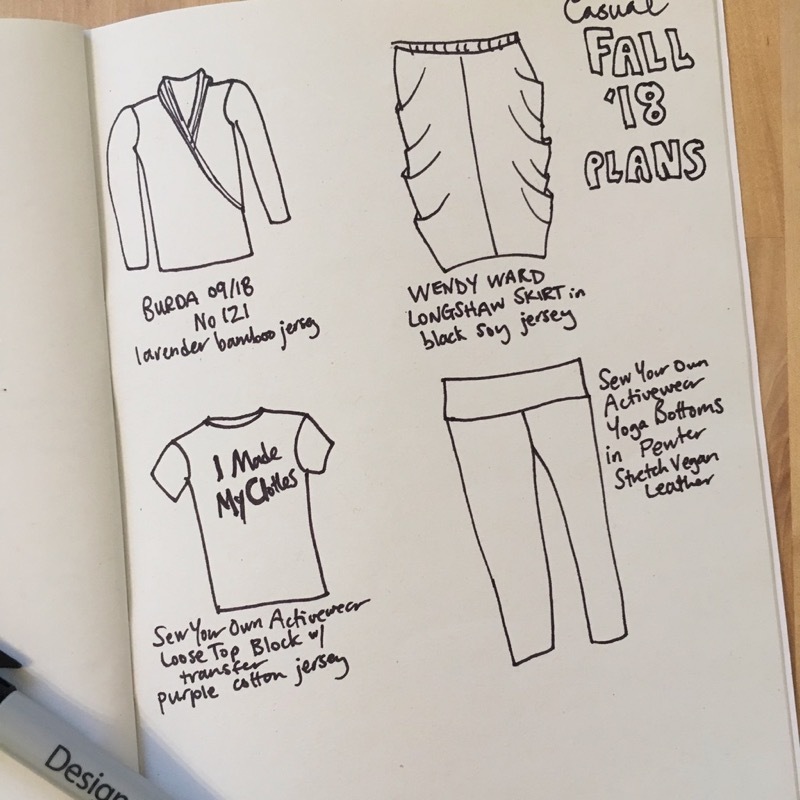 I think it makes it more interestig and why not because when you make your own clothing you really can have it all whereas when you buy your own clothing you are limited by the trends and availabilty. Reading for example Burda helps me too. 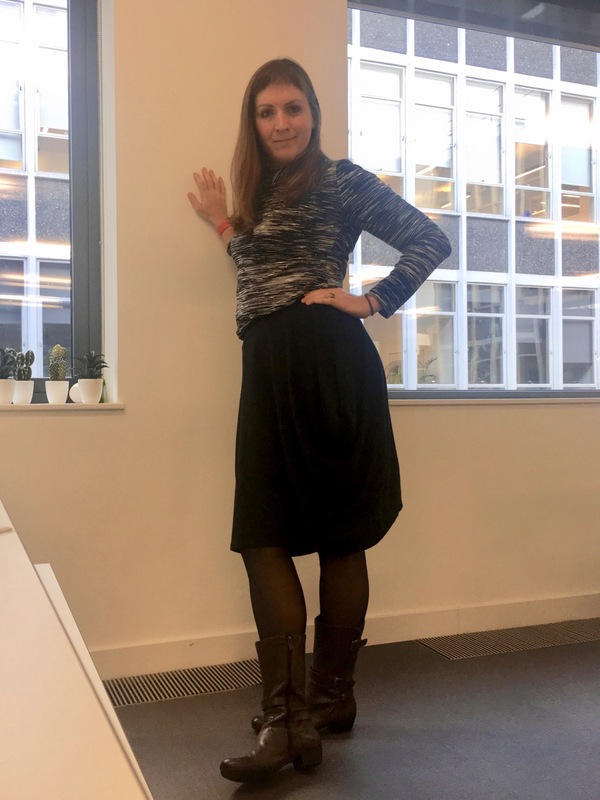 I never read fashion or gossip mags so suddenly when I got into Burda and reading blogs this opened up a whole new world of fashion – not just sewing- because everyone makes different patterns. Thanks for posting and really love the skirt. Yes, and I always learn something from the experience of trying something new. Even when that something is that I can’t stand the silouette or the fabric choice!